Chef Adam Hegsted's new burger spot is set to open later this month. By the time readers are holding this issue in their hands, the latest culinary creation from Spokane chef and restaurateur Adam Hegsted will either be open, or just days away from its debut. Aligning perfectly with the timing and theme of the Inlander's first-ever Burger Issue, Hegsted's latest — becoming his seventh regional restaurant project — is called IncrediBurger & Eggs. Hegsted describes his new, burger-centric downtown Spokane spot as having an upscale, yet fast-casual concept. There's no table service; after placing an order at the walk-up counter — or by using one of the restaurant's self-service kiosks — customers get a number for order pick up at the counter when ready. Orders can also be made online for pick-up. "We wanted to make it really approachable and convenient and delicious," Hegsted says. "We've been working on a burger concept for a while, and then this spot opened up." Despite being considered in the realm of "fast-casual," make no mistake that the quality of ingredients at IncrediBurger, nor the offerings of both classic and creative takes on the American grill staple, will be any less than can be expected from Hegsted's many other restaurant kitchens. Still, the majority of burgers on the menu are priced at $7, and any can be ordered with a gluten-free bun, sans bun or with a lettuce cup. Sides to add on include beef-fat fried french fries, sweet potato tots, vodka-battered onion rings, fried pickles and poutine (from $4-$8). 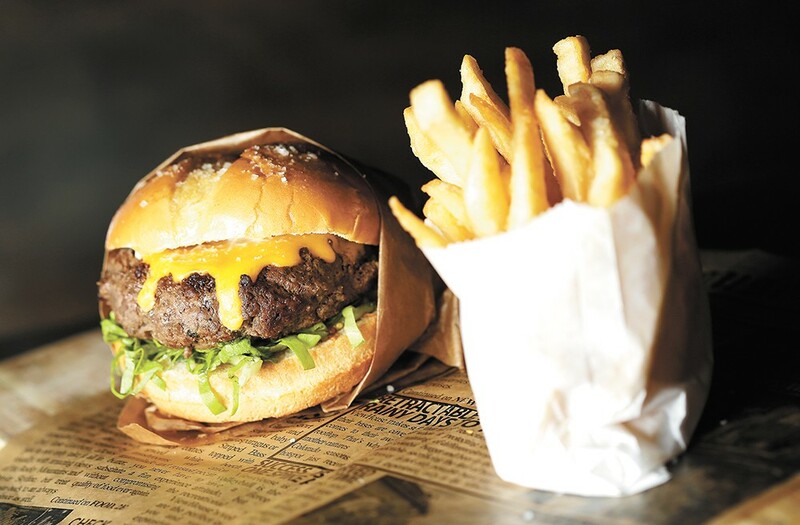 The beef is regionally sourced, and all the burger components, from buns to sauces and even American cheese, are being be made in house, Hegsted says. IncrediBurger's signature patty blend is seasoned with a special umami seasoning which Hegsted and his team have been developing since participating last year in the James Beard Foundation's Better Burger Project. "It's a Japanese flavor sensation that gives you a really mouth-savoring sensation," he explains. "It's like what's in soy sauce, parmesan reggiano, dried mushrooms and also seaweed. It's almost salty without being salty." On the burger list, IncrediBurger starts with staple sandwiches; the Pure Gold (Wagyu beef with aged cheddar, truffle foie gras mayo, chianti jam and pickled mustard seeds) and the Classic (lettuce, grilled onions, tomato, ketchup, "incredisauce" and pickles; add cheese or bacon for $1). There's also a PB&J burger with jalapeno jelly, peanut butter sauce and thai aioli, a Mexican-inspired sandwich, a blackened steelhead burger, the vegetarian-friendly "Lil Greeky" chickpea patty with cucumber, hummus, onion and tzatziki, among several other variations on a formed patty between bread. The second half of the restaurant's name is a nod to the eatery's all-day, egg-centric breakfast sandwiches; all but a few are $5 each. There are classics with bacon or sausage, eggs and cheese, along with some less traditional takes, which typify Hegsted's comfort food mash-up style. The Panwhich ($5), for example, has a mini-pancake maple syrup bun topped with house-made turkey sausage, an over-medium egg, cheddar cheese and smoky aioli. Breakfast items also include egg scramble bowls ($7); other morning-inspired sides include home fries, pancakes, buttermilk biscuits and donuts. IncrediBurger's third focus is what Hegsted calls "boozy milkshakes" ($11/each; all will also be available without blended spirits for $4 each) which are house-made ice cream blends in flavors like chocolate-avocado, Nutella, cinnamon toast crunch and toasted honey butter. "It's sort of a little blend of old and new. We wanted a soda-pop feel but we have a lot of modern touches," he says. "We'll have old-fashioned Coke bottles and we'll have retail wine." IncrediBurger's bar will serve beer, wine, cider and kombucha on 12 taps, in addition to non-alcoholic fountain sodas, bottled wine and beer, craft cocktails, mimosas and bloody marys. The original print version of this article was headlined "Incredible Eats"